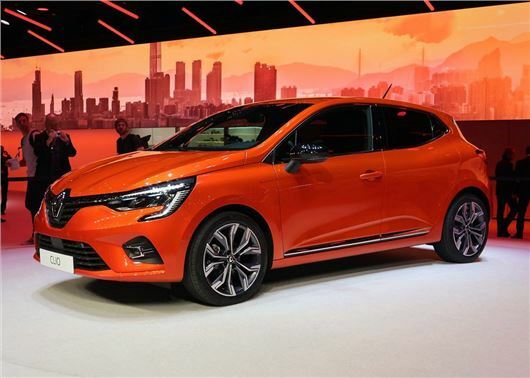 Renault has unveiled the all-new 2019 Clio. The Ford Fiesta rival will go on sale in the autumn from £14,000 and be offered with petrol, diesel or hybrid power. The 2019 Renault Clio has been redesigned from the ground up, with its upmarket cabin being the most notable upgrade. The soft-touch dashboard is dominated by a bright 9.3-inch infotainment screen that links direct to the car's all-new digital instrument cluster. Spec levels for UK cars are still to be confirmed, but Renault is promising high levels of equipment across the range and all models get LED headlights as standard. The fifth-generation Clio boasts one of the largest boots in its class with 391 litres available with the rear seats in place; that puts its ahead of the SEAT Ibiza and more expensive Volkswagen Polo and Ford Fiesta when it comes to outright carrying capacity. The rear seats can also be folded flat to create more room, and a double floor should help distribute loads. The seats will provide unrivalled comfort, says Renault, while their clever design makes for a spacious-feeling car, despite its external dimensions being smaller than the outgoing model. Renault hasn't released any details about fuel economy, but expect the Clio to launch with a range of conventional petrol and diesel engines. Buyers will be able to choose from a 1.0-litre in turbo and naturally-aspirated petrol flavours, as well as a 1.5-litre diesel. Unlike the Peugeot 208, the Clio doesn't get an all-electric option. Instead, a 1.6 petrol hybrid will be added to the line-up in 2020 and allow drivers to drive on electricity for 80 per cent of the time in towns and cities, according to Renault. The new Clio will be available in R.S. Line guise - a replacement for the former GT-Line. This offers sporty looks and an interior inspired by Renault Sport models, without the more expensive running costs of a true hot hatch. It takes a similar approach to Ford's Fiesta ST-Line, with a 'F1 blade' honeycomb grille and 17-inch wheels contributing to its sporty looks. Although prices are yet to be confirmed, expect a small increase over the current model's £13,615 when the 2019 Clio goes on sale later this year.